What should be the attitude of leaders’ visits to places of worship? The matter is very complex in a society like that of India where the hold of religion on the society has been strong and is becoming stronger. In many a Western countries where Christianity is the religion of majority the visits to Churches by most of the people has been declining and one does not hear much about this being a political issue at all. 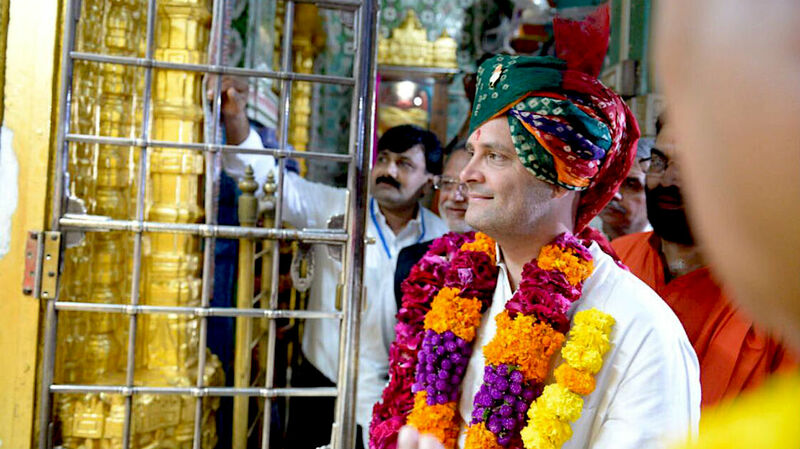 The matter has come to fore once again as Rahul Gandhi (RG), the President of Congress party has been visiting temples with great frequency be it Gujarat or now UP. In Gujarat where the Congress did remarkable showing despite failing to win the majority, many factors must have played the role for its ascendance, the major being the inclusive approach of Congress where the issues of marginalized communities, economically or caste wise, were taken up in forthright manner, as exhibited by allying with leaders like Hardik Patel, Alpesh Thakor and Jignesh Mewani. In addition RG sort of went on a spree of visiting temples. This time around the secular writers and intellectuals were not much disturbed by these visits; the people who got disturbed and criticized these visits were primarily from RSS combine, like U P chief minister Yogi Adityanath called it “hypocrisy and sham”. He stated at a rally. The truth is that Mahatma Gandhi and Nehru both had opposed the renovation of temple at the state expenses and not the temple renovation as such. While RG’s visits are coming to the focus now most of the leaders of BJP are very explicit about their visits to holy places and make a great din about it. When we begin from Nehru, he was an agnostic and very critical of blind faith, a great promoter of scientific temper, a value which finds place in our constitution as well. The major visits to temples by top leaders as such begin with Indira Gandhi in late seventies and early eighties. She probably was shaken by the Ayatollah Khomeini, a cleric coming to power in Iran and the rising influence of RSS here in India. She must have seen that the impact of religion in social life is increasing, and so such visits by her. During the decades of eighties as such religion did not remain a private matter as envisaged by our Constitution; by people like Gandhi and Nehru and a blatant use of religion in political arena began with BJP, dumping its original agenda of Gandhian socialism and picking up Ram Temple as the central political plank. This paid BJP rich electoral dividends in times to come. The centrality of places of worship in our political space got intensified and the rightward shift of Indian politics, ascendance of religious right in form of BJP-RSS started going up. The attitude of different political formations was diverse. Apart from temple visits, the social aspect of Ramadan, the Iftar was organized by many politicians. Now the competitive religiosity took over by political parties, led by the BJP, for whose leaders carrying religion on their sleeves was most overt. Some religio-social programs like Karva Chauth were overtly celebrated by the likes of Sushma Swaraj, while Lalu Yadav ardently organized the Chat puja. Now these rituals are dime a dozen to be recounted here. In the era where the religion is overtly being used for political agenda, the visits to temples is a sub set of actions, being resorted to by even those who do not primarily indulge in politics in the name of religion. BJP ruled state Governments have gone further with the likes of Yeddyyurappa making huge donations to temples when he was CM and MP Government printing and publishing Hanuman Chailsa through its publications departments. The need is to distinguish between social aspects of religion and ‘religion as a cover of political agenda’. The change from the times of Nehru where the practice of secularism by state was regarded as ‘not secular enough’, we have come to the times where the word secularism is being called as the biggest lie of India by the BJP leaders like Yogi Adityanath. In the campaign, which is picking up in Karnataka as a prelude to Assembly elections, the BJP leadership is presenting Congress as the anti Hindu party. Most of the election campaigns are being taken on the terrain of religion as witnessed in Gujarat, where the famed Vikas, gave way to Mughalia Sultan, Allauddin Khilji and the like. The lip service to the issues of people related to bread, butter shelter education and employment is being aggressively substituted by emotive issues related to religion. It’s a tragic sign of times where the political terrain has been mixed with religion. It’s a terrible time that leaders of a national party like Congress have to visit the temples to wash off the anti Hindu tag from their foreheads. The temple visits are not soft Hindutva in any way. The popularizer of the word Hindutva, Savarkar himself was an atheist, focusing on politics in the name of Hinduism rather than religiosity. Nehru had said that his biggest challenge is to uphold secular Constitution in a society grip of religiosity, with religiosity dominating the social space today, what would he say?